This is my second E.L.F haul. I forgot to take pictures of the STUDIO brushes as I sent them for washing. Overall, I'm rather pleased with the brushes I've gotten. 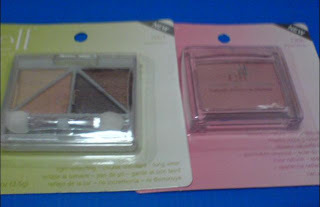 Especially the complexion and powder brushes which were just amazingly soft. I think they are really value for money. I also purchased their concealer brush and eye precision brush. They are really small, probably even smaller than other brushes of the same kind from other brands. If you are interested in the STUDIO brushes, I would say just get the bigger brushes. They are more value for money as they have a whole lot more bristles. The smaller brushes are all right but I just get the ripped off feeling whenever I looked at them thinking how tiny they looked. Here are some of the other random items I've gotten. 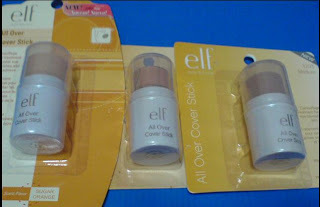 I got the All Over Cover Sticks in Fair, Light and Medium. Shades look true to picture except Fair is really lighter (the cap makes it look darker). These are cream bases or concealers. They smell of orange sugar. First impression. The "Orange Sugar" smell gave me a headache. Fair - Very fair light beige colour. Sorry, I'm terrible with colour descriptions. The textures of the 3 color sticks are somewhat similiar but the colour stick in Light is extremely greasy. I bought the 3 of them hoping to have a variety to blend as my undereye concealer. My verdict? They are ok. They cover quite well compared to normal drugstore concealers. However, I would not recommend as they are greasy. It's probably my first time looking at my undereye areas and it's slightly covered (I tried the orange one for undereye circles) but it's super greasy. The greasiness is such a turn-off. Fair was totally too fair for me. But I managed to use it as a eyeshadow base or primer. It wasn't too bad. Pros: Covers all right, easy to blend, can work as eyeshadow base. Cons: Can be greasy, orange sugar smell can be annoying after a long while. I also got the Duo Eye Shadow Cream in Butter Pecan and Mocha Swirl. These are cream eyeshadows that are not sheer, they are pigmented. However, these were a disappointment for me. Found them to be very greasy. Eyeshadows do stick but if you don't like greasy eyelids, don't get these. I had better luck with the All Over Cover Stick as eyeshadow base than these. Pros: Can be used alone as eyeshadows as these are pigmented. Cons: So greasy if you just use them alone. Not reviewing the Brightening Eye Color in Butternut as I just bought it to restock. Got another Natural Radiance Blusher in Innocence. The colour looks true to picture. If you have never tried their blusher, I think their blushers are worth trying. However, the packaging is cheap to the touch. You have to slide it open and I don't like it. Innocence appears as a natural flush on the face. Cons: Cheap packaging. Some of the colours lack depth and can be uninteresting. 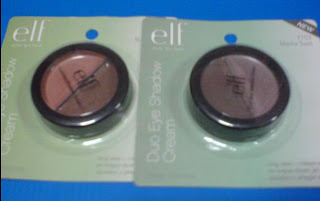 Ok, lastly I got the Under Eye Concealer & Highlighter from E.L.F Studio Line. This is in Light/Glow. It looks small in real life. If you are wondering about the material of the packaging, the material's like made of rubbery frosted plastic. I don't like touching it at all. 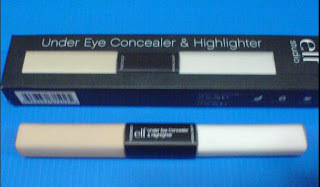 The concealer shade is a light beige colour. It did nothing for my undereyes (it was too light so it looked ashy). As a concealer, it was not too bad. Very easy to blend. Think it's an illuminating concealer as it looks brighter and light seemed to bounce off (so that people wouldn't notice the scars concealed) after blending. The highlighter shade is a opaque white shade. I have no idea what to do with this part as I'm not really interested in the white liquid. Pros: Easy to blend. Illuminating is a bonus. Cons: Cheap packaging. Container seems small so I doubt it will last long.